WanderMan: Even The Simple Maintenance - Check Your Carbon Monoxide/Propane Detector! Even The Simple Maintenance - Check Your Carbon Monoxide/Propane Detector! Last week I wrote about checking to make sure your RV smoke detector (or more than one!) was working well and had fresh batteries. That was very important. 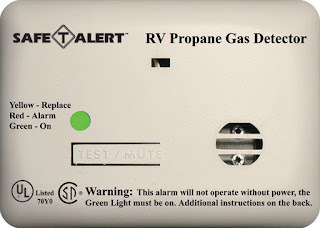 One of my readers pointed out that the Propane Gas/Carbon Monoxide detector is of equal importance in making sure you are safe in your RV. Any propane (LP) gas leaks can usually be smelled before they become a problem. The mercaptan that is added to propane is a substance that gives it that bad "rotten egg" odor. It's a quick way to know if you have a leak as a very small amount stinks to high heaven. Even so, you may not notice until it's too late. Having an LP detector is an extra layer of safety. The same cannot be said about Carbon Monoxide. It is odorless and very deadly in small concentrations that could occur inside an RV. It is produced by all gasoline burning engines and all propane appliances. We have these in our RVs. How can we protect ourselves? Simple. 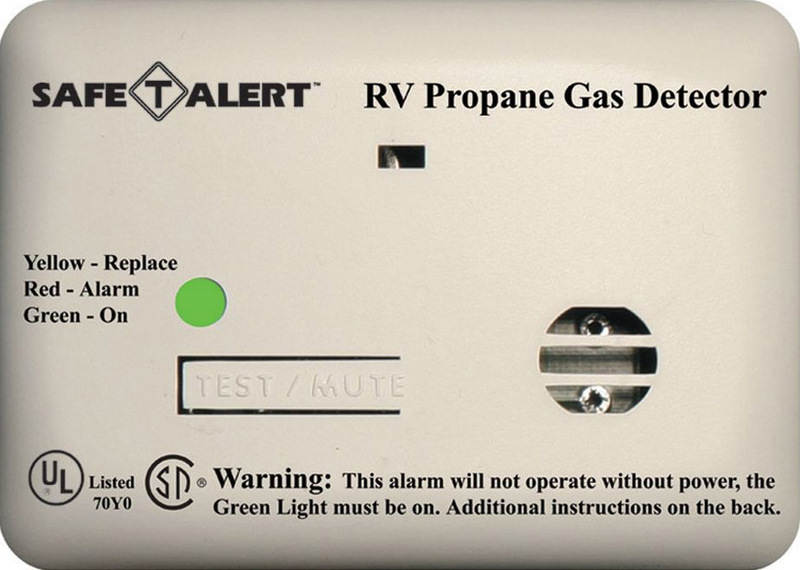 Most (if not all) RVs have a Carbon Monoxide (CO) detector installed. This device will sound a loud alarm if it detects very small amounts of CO. 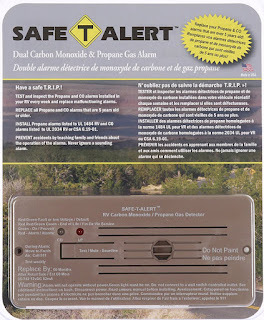 Many of them are dual detection systems and will also detect Propane (LP) gas as well. Just like smoke detectors, it is worth taking a look at them when you inspect your RV( I like to test them every month). Some run on batteries, and those should be replaced at least once a year or more often if they are exposed to extreme cold that may shorten the life of the battery. In my case, the LP/CO detector is wired into the coach's main house battery system. To test it, I simply push and hold the TEST button until it sounds the alarm. You could get a small sample of CO or LP gas to test it with, but that can be difficult and possibly dangerous -- I don't recommend it. If it works, great. If not, REPLACE IT! OK, maybe there is a wiring problem or your house battery is dead. Check the battery and 12V house system. Then, if that is OK and it still won't work, REPLACE IT! It's not worth the risk. There are a few companies that make detectors that recommend they be replaced every 5 years. And some of those actually "chirp" when it's time to replace them. It's a bit of an expense, but why not? A little under (or over for built in) $100.00 for 5 years...that's not much money for 5 years of of service and peace of mind. Go for it! Besides, there are newer models that use a "Fuel Cell Electrochemical" sensor that is more sensitive and less prone to false alarms. Great! An upgrade with your replacement. How do you know if you are beginning to get poisoned by Carbon Monoxide? If you feel any of these and don't have the flu or some other disease you are aware of, get outside immediately and breathe normally, away from your RV. If you begin to feel better, there is good chance you just saved your life. If you don't feel better, call 911 and request assistance!! The sad thing about CO poisoning is that it often happens at night, when you are asleep, whether from a heating appliance or a bad generator exhaust or something similar. You don't have a chance. You'll never know there was a problem and the results could very well be fatal. Isn't it worth around $100 to shift the odds in your favor? Better safe than dead. Rich, thank you for listening to a crazy rambling email. 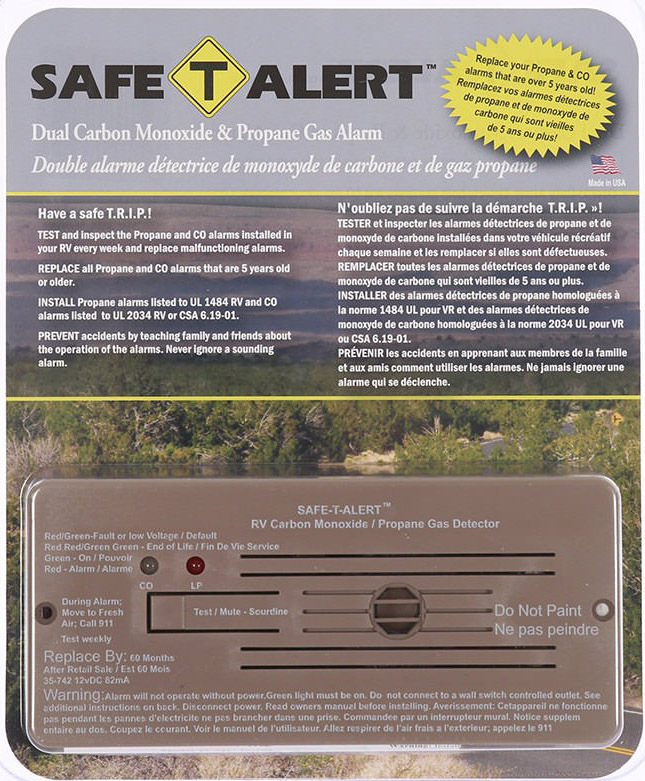 Hopefully you might have just saved someone's life with this carbon monoxide post. Love your posts! You made an excellent point. If we can save one person, we've done our job! Spread the word, the more people that read about the consequences the better! P.S. You are most certainly NOT crazy!